As nursing is the fastest growing profession in the medical field, more and more people are seeking a nursing license. There are a few important steps that must be taken in order to get a legitimate nursing license. Licensing is required regardless of the type of nursing being performed. Those with a master's degree or doctorate in nursing have more independence, operating in a similar fashion to traditional medical doctors, but they must still take appropriate steps towards obtaining licensure, which are similar to those outlined below. Before you can even consider applying for a nursing license, you must undergo the intensive training required of all nurses. Not all nurses receive the same instruction. There are multiple levels of education that one can receive prior to entering the field. 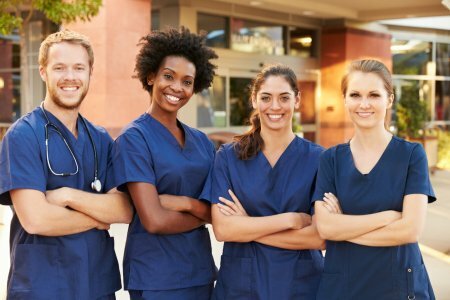 Before becoming a Registered Nurse (RN) one must either obtain an Associate's Degree in Nursing (ADN) or a Bachelors of Science in Nursing (BSN). Choosing between these can be difficult. The ADN requires less time and offers an opportunity to quickly enter the field and start working. On the other hand, the BSN provides additional education in order to ensure the highest quality of nursing care is provided. Although the initial salary of a nurse with an ADN is almost identical to that of a nurse with a BSN, the latter have the potential to make more money in the long run. There are also many more job opportunities for nurses with this higher level of education. Management positions, education opportunities, and additional independence await those who pursue a BSN. For those seeking even more education and future salary benefits and independence, both a Masters of Science in Nursing (MSN) and a doctoral degree require more initial time and effort to obtain but offer greater options for career development. Once all the required schooling has been completed, the application process can begin. One of the first steps in this process is completing the National Council Licensure Examination for Registered Nurses, or NCLEX-RN. This exam objectively monitors nurses’ ability to provide treatment in a variety of settings. Instead of focusing on individual facts, this exam is based on real-world application and provides an opportunity for nurses to demonstrate their problem-solving abilities. Once this exam has been completed successfully, the application process can continue. Each state has varying requirements for entering the nursing workforce but there are similarities across the country. NCLEX scores typically must be sent into the local Board of Nursing Education. Many states also require transcripts from an accredited nursing program. Typically, a small fee is required to process this information and generate a license. During this process, a background check is also completed. Once all scores, fees, and checks have been processed, the license will arrive in a relatively short period of time. This license will include a license number. This number allows employers, patients, and others to verify current license status. This ensures that only qualified nurses are in the field and treating patients. Many states have continuing education requirements to prove that nurses are capable and competent over long periods of time. These requirements vary by state, so check with your local nursing education board for specifics. Learn more about nursing license requirements and nursing license renewal.